Many, many people suffer from headaches - tension, hormonal, sinus, migraine...sometimes I feel like I get in a rut where I am popping ibuprofen every afternoon. I don't like doing that. If you feel the same way, here are some simple, natural ways to ease headache pain, and ward off daily headaches. Ice: This can be one of the most effective ways to treat any kind of pain. Ice numbs the nerves and causes them to STOP sending pain signals to the brain. This breaks the pain cycle. Often when I have a headache, I put an icepack at the base of my neck and it really helps. Just last night, I had a sinus headache, and the ice pack felt better on my forehead, so that's where it sat as I fell asleep. Ice also reduces inflammation, which can be a major cause of headaches. Shunt: This involves both ice and heat. Run a footbath, or a regular tub, with hot water. Place your feet in the water. Place an icepack on your head. This will draw the blood away from your head, to your feet and should ease some of the discomfort. Hydration: I will confess, I am the worst at this one. I like to drink coffee - not water. But I do feel better when i drink water - and dehydration has been proven to be a major cause of headaches (especially ones that occur at the end of the day). 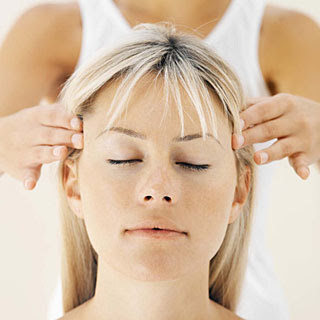 Massage Therapy: Especially useful for tension headaches, or stress-induced headaches. Your L.M.T. can release the tension in your muscles, reducing the constraint on your nerves. This does not have to be painful "deep tissue" massage. Just a simple, slow massage can melt away many layers of tension. A light scalp massage can be helpful too - this is a good one to use on your kids. So there you have it - a few simple tips to headache pain management. Let's try to be responsible for our health. Those things I have mentioned are a lot cheaper than Dr. visits and OTC medication. It IS easier to pop a pill, but is it better? I don't think so. It's also very empowering to know that you eased your family's pain. YOU can change your circumstances. We do need Dr.s for some things, yes, but let's try to be a bit more responsible in our health care (I'm speaking to myself here too). I wish you good health today.